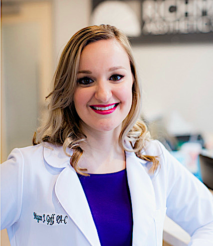 Megan J. Goff, PA-C is a board-certified surgical physician assistant, bringing her medical knowledge and compassionate spirit to patients of Richmond Aesthetic Surgery. She is committed to helping patients feel at ease as they go through the surgical process by offering high quality care from the consultation to the recovery. Megan graduated from James Madison University in 2007 with a Bachelor of Science in Biology. During her undergraduate education, Megan completed research in the field of genetics, and she also was part of the Big Brothers Big Sisters program in the area. Continuing her studies, Megan attended Shenandoah University – one of the top physician assistant programs in the country – earning her master’s degree in 2012. She acted as the fundraising chair of student council and also participated in the international medical mission trip. Among the many procedures offered at our practice, Megan is particularly passionate about helping breast reconstruction patients battling breast cancer. She is proud to work with these patients and extends her support beyond the office. Megan is a Komen educator for the Susan G. Komen organization – she strives to empower women in their journey and raise awareness on breast health. In addition to her work on the topic of breast cancer, Megan stays active in the professional community through her memberships in the(H) Virginia Academy of Physician Assistants (where she was recently awarded in 2016 for PA/Physician Partnership of the Year), the American Academy of Physician Assistants, and HYPE, which is a young professionals organization of the Greater Richmond Chamber of Commerce. She was also awarded Best Bedside Manner of Physician Assistants by Our Health Magazine in 2016. When not working, Megan enjoys traveling around the world with her husband Matt, spending time outdoors, and boating.